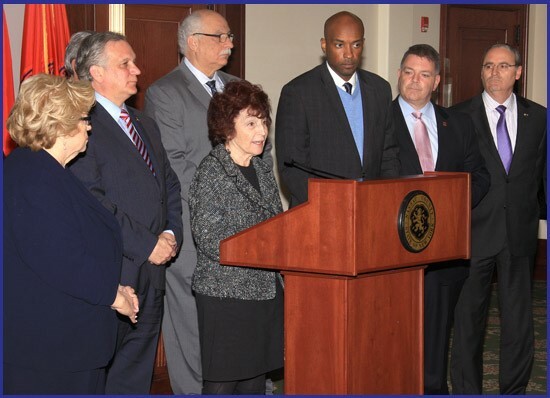 Nassau County Legislative Presiding Officer Norma Gonsalves joined Nassau County Executive Edward P. Mangano and other county legislators to announce $3 million in new funding for NICE Bus operations in 2016. The County will work with NICE Bus CEO Mike Setzer to develop a route restoration plan. In January, NICE Bus eliminated eleven bus routes due to low ridership and budget shortfalls. In an effort to restore bus service, the county today announced $3 million in additional funding will be given to NICE Bus. The 2016 Budget approved by the Nassau Legislature maintained full funding amount for NICE bus, however, the bus operator declared a budget shortfall due to staffing costs which resulted in the route cuts. “In addition to helping restore funding towards the eliminated routes, we will also search for ways to seek additional revenues for NICE Bus in 2017 and beyond in order to avoid future route cuts,” said Gonsalves.